In this first week of 2013, I want to wish a sweet (and indulgently butter-filled) Happy New Year to all who came to visit The Kitchen Boudoir in its inaugural year. 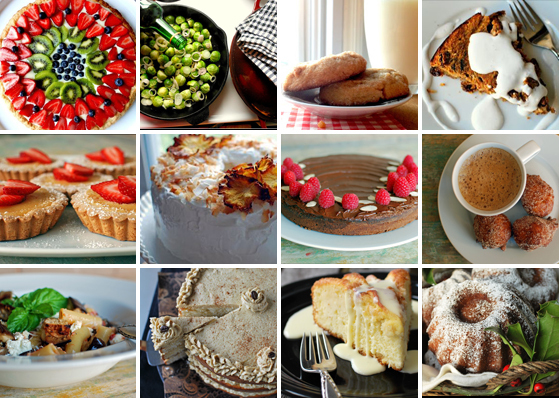 Save your appetites for more delicious recipes and intimate dishing in 2013! January 22nd marks the first anniversary of this blog, which will (obviously) be celebrated with multiple helpings of cake and a birthday blog post of its own. Below, you'll find a tasty selection of recipes from each month of this past year - Enjoy! 1. Who is your favourite philosopher? Lately, I've been cultivating a philosophy inspired by reading the pages of my cookbook collection (I have a tendency to read cookbooks like they're novels - I've also found that a recipe for a dish can often be translated into a recipe for living). I've been inspired by Lidia Bastianich and her philosophy of cooking fresh, seasonal, ingredients with love to magnetically draw people together around a table. Currently, I'm reading Chef Hubert Keller's memoir/cookbook Souvenirs, and am loving his attention to detail: how he meticulously plans and prepares, but deliberately stays open to 'go with the flow' of what the ingredients (and the customers who will eat them) are communicating. 2. What is your favourite number? I don't know if I have a favourite number, but it seems every time I look at the clock or other random places, 11:11 shows up. I take it as a sign - that things are exactly as they should be - that all is ok. My inner pre-teen still makes a wish. Every time. 3. What is your favourite animal? My current favourite animal is my piano teacher's dog Jack. Jack and I are in unconditional love. It is distracting when I am trying to play scales and he looks at me with his love eyes. 4. What is your favourite time of day? That moment in the early evening when the sun is on an angle, and everything is golden. I love it. 5. What are your Facebook and Twitter? I thoroughly enjoy connecting with people via the many social networking options - please friend/follow/like/pin me! You can find me as The Kitchen Boudoir on Facebook, as @kitchen_boudoir on Twitter and Instagram, and as kitchenboudoir on Pinterest. 6. What is your favourite holiday? I love the implied indulgence of Thanksgiving, where my friends and I are thankful for what happens when I introduce seasonal produce to its buttery piecrust destination. 7. What is your favourite physical activity? Walking. In the spring, I will be walking 500km across Northern Spain on an ancient spiritual pilgrimage - the Camino de Santiago. Over the next three months I will be breaking in my new hiking boots, which my friends helped me buy with the caveat that they not be seen with me wearing them. 8. What is your favourite non-alcoholic drink? There is a small cafe across the street from my house, right next to the laundromat, that makes a perfectly pulled americano. I'll add a touch of cream and doing laundry no longer feels like a chore. It's caffeinated incentive for self-care. 9. What is your passion? I love to sing and music is something that truly moves and inspires me, however, get me talking about food and my eyes light up and it feels like I'll never run out of things to say or learn. Or eat. Or think about eating. My friends wisely decided to move close to me, as I have a tendency to act on this particular passion, and there is always plenty to share. I don't know, studying pastry arts has you pretty high up on the cool list, in my books. FYI - I totally read your comment in stretched out yoga pants. Thank you for including me in the list of kinder spirits :) It was a pleasure meeting you the past year, hope we will get to be at an event this year as well. Yes, it would be great to cross paths again. Happy New Year to you too, Akheela! Thank you so much for passing the award on to me and congratulations to you! Thank you for your kind email too. You had a great 2012 so here's to 2013! You're welcome :) Happy 2013! I love reading your blog! Happy New Year! I also think it's awesome that you're walking the Camino. My parents did a good chunk of that last spring! They both had an amazing time. Happy New Year Katherine! Yes, I am looking forward to the experience - just bought my boots yesterday. It seems once you mention the Camino, everyone has a story about it, or knows someone who did it. I love that. Oh my gosh, thank you SO much for including me here! With many of my very favorite bloggers! Your award is much deserved, and I'm so thankful to you for passing it along to me. You're welcome! So glad you can relate - any favourites? Thank you so much for the award! Congrats on a wonderful 2012 blog-wise - I especially enjoyed all of your scrumptious desserts - and I can't wait to read what 2013 brings (like the 500km pilgrimage - wow)! Thanks for including me on your list!!!! I am so happy I made it. LOL! And I can't wait to read all about your Camino walk - assuming you're going to share it with all of us here on your blog. But you have to!!! Ah, love Cherry Bomb, but I'm further up the Roncy line. I'm talking about Belljar Cafe - excellent espresso. I hope to write in some meaninful way about my Camino trip (on KB, another blog? a book?!) - most likely after the fact. From what I read and hear, I'll be too busy ignoring my blisters with rioja and calamari to post en-route. But it feels necessary in that deep, 'have-to' way to write about it. I'll keep you posted as to what happens, for sure. You do know that dirty jokes are as common as butter here at the Boudoir, right? Now I can't say pink peonies without thinking about... well, now you've done it! Their kitchen must've been very busy. Those pastries are so delectably delicious in any way I think about it.